^ a b Silva-Rodríguez, E, Farias, A., Moreira-Arce, D., Cabello, J., Hidalgo-Hermoso, E., Lucherini, M. & Jiménez, J. 2016. Lycalopex fulvipes. The IUCN Red List of Threatened Species 2016: e.T41586A85370871. doi:10.2305/IUCN.UK.2016-1.RLTS.T41586A85370871.en. Downloaded on 27 November 2016. ^ Farías, A.A., M.A. Sepúlveda, E.A. Silva-Rodríguez, A. Eguren, D. González, N.I. Jordán, E. Ovando, P. Stowhas. 2014. 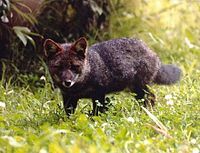 A new population of Darwin’s fox (Lycalopex fulvipes) in the Valdivian Coastal Range. Revista Chilena de Historia Natural 87:3.